I always felt that I could watch Jason Segel do almost anything in a film, and this film takes the concept to the extreme, as most of what he does is hang around waiting for a sign from the universe so he can direct his life, beyond smoking weed in his mother’s basement. He kept my attention, so I also waited for a sign for something to happen in this movie. Meanwhile, the wonderful Ed Helms (great in The Hangover) and Judy Greer keep things interesting. Susan Sarandon plays the put upon sensible mother of the guys (yes, they’re mismatched brothers), stuck in an office cubicle. No spoiler here, but Jason finally takes action and the multiple plots come to a satisfying conclusion. I felt proud to have identified Rae Dawn Chong, since I don’t remember noticing her in a movie in the past 25 years. The Duplass brothers directed and wrote this, as they did the wonderfully quirky Cyrus. Overall, it’s an enjoyable (short at 83 minutes, all the action happens in one day) quirky film that beats most Hollywood big budget movies in my book. The Duplass brothers are my second favorite writing/directing/producing brother duo (behind the Coen Brothers and ahead of the Farrelly brothers). All three are into comedy (although the Coen brothers make great movies in other genres too) and both the Coen and Duplass brothers do make very quirky comedies. Are there other film making brothers I’ve forgotten about? It’s pretty boring when I totally agree with Bill but I do here. I thought the movie got off to a slow start but picked up a lot when Jeff got out of the house and started interacting more with the other cast members. Jason Segel and Ed Helms are perfect for the Duplass brothers mumblecore style of film making. In the end this is a good comedy about people dealing with their emotional problems and a satisfying conclusion. I even agreed with Bill about Rae Dawn Chong (Tommy Chong’s daughter). According to IMDB she has been steadily employed for the last 30 years but the movie I remember her from was 1981s Quest for Fire. Charles Bradley: Soul of America – 3 out of 5 – Charles Bradley was living in the projects in Brooklyn, looking after his mother and doing a James Brown cover act when he finally got his big break and released his first album at the age of 62. This documentary covers the time leading up to the release of his album and his first tour. The tour includes a stop at the Bardavon Theater in Poughkeepsie where he lived for several years in the 70s. We saw him at ACLfest last year and he is good (and as the documentary shows, a truly nice guy). Shut Up & Play the Hits – 3.5 out of 5 – LCD Soundsystem was a great dance-punk band that was led by James Murphy. This is a great concert film of their last performance held last year at Madison Square Garden. The concert footage is great and it’s juxtaposed with an interview of James Murphy and footage of him before and after the last show. My only complaints is they didn’t include any interviews with other members of the band or delve into how the band evolved. Marley – 4 out of 5 – this is the definitive documentary about the great reggae singer Bob Marley who died at age 36 from cancer. It shows how he grew as an artist starting in the early 60s and gives great insight on Marley’s personal life. This also has great music and concert footage. Under African Skies – 4 out of 5 – Paul Simon’s Graceland is one of my favorite albums. This documentary follows Paul as he returns to South Africa 25 years after making the album for an anniversary concert with his original collaborators. The album was made while South Africa was ruled by an apartheid regime and a U.N. cultural boycott was in place. This movie does a great job exploring the political ramifications and backlash that Simon encountered after the album was released for ignoring the boycott. The movie also does a great job examining the collaborative process between Simon and the South African artists as they created the music and Simon’s creative process as he created the album. There is great archival and recent footage of the concerts and the music is great! America’s Parking Lot – 3 out of 5 – A very entertaining documentary about a group of Dallas Cowboy fans/tailgaters. The film focuses on the passion/obsession of a group of fans who have tailgated together for many years. They show up hours before game time and live and die with the Cowboys. The film covers the last couple of years playing at the old stadium before moving to their new stadium a few years ago. As the move to the new stadium nears the focus of the movie shifts to the economics of billion dollar stadiums and the impacts to the average fan. At the new stadium fans have to pay tens of thousands of dollars just to have the right to buy the tickets. Not only are many of the tailgaters forced to give up their tickets but the ones remaining no longer park together further breaking up the group. Even though I hate the Cowboys the film makes you feel for these fans. I plan to have my wife see this movie to show her how lucky she is that I’m such a relatively laid back fan! This is a fun, witty movie, in large part due to the excellent acting, from the leads, Channing Tatum and Jonah Hill (I never tire of watching him, check out Cyrus which most people have probabaly not seen), to the bit players like the Chemistry teacher who’s tongue tied in the presence of pretty boy Channing in her classroom. I might have laughed more if I hadn’t already seen some of the best parts in previews about ten times. So the 11th time is almost a yawner, but there are plenty of gems, such as the non-explosive car chase scenes, and the genuine chemistry between the guys, including genuine chemistry experiments by real (cool) nerds. Yes, the tables have turned in today’s high school where dumb bullying jocks no longer rule; true cool is now defined by eco-awareness and respect for studious, gay students. I guess some of today’s real-life students (see Rutgers’ recent bullying conviction) didn’t get the memo. Oh, look for a surprise non-credited showing at the end of someone you will recognize, as well as the most blatant teaser for 21 Jump Street II coming next. Bring it on! Bill C’s Review – 4 out of 5 (originally posted during SXSW) – Jonah Hill and Channing Tatum star in this comedy. The movie-makers take the title and premise but little else from the old TV show that helped launch Johnny Depp’s career. This movie has lots of hilarious/farcical moments and no potential source of laughs is off limits. Hill and Tatum make a great comedic duo and it’s fun to see their high school persona’s flip as they return. This has a great cast including Rob Riggle, Ice Cube (very good) and others. There was a great Q+A after movie. Jonah Hill was hilarious and it seemed like all involved had a great time making this movie and it shows on the screen. This opens next week and except for those who don’t like rude/crude is highly recommended. This is the type of movie that is best when seen in a crowded theater so I recommend seeing this early in it’s release. Brooklyn Castle – 3.5 out of 5 – This was a very entertaining documentary about a lower income, inner city middle school in Brooklyn that has been the most winning chess team in the country for years. The movie shows the impact the team has on these kids lives and the impact of budget cuts on the team beginning with the recession a few years ago. Not only are the kids incredibly good chess players but they are great kids that you quickly connect with. The teachers are awesome – incredibly dedicated to their students and have a real impact on their lives. The movie is funny, touching and uplifting. The Raid: Redemption – 4 out of 5 – This is a great action/martial arts movie! A SWAT team attempts to move in and clear out a building controlled by a drug lord. The drug lord is prepared and pretty soon into the movie it’s down to just a few remaining cops. There are several great action scenes and the plot is really good. This was a packed theater (1200 people) and there were several collective crowd groans, cheers and applause during some of the action. This is a foreign film with subtitles and very violent. If you like this type of movie don’t miss this one when it is released in the next couple of weeks! Beware of Mr. Baker – 3.5 out of 5 – A good documentary about Ginger Baker, the onetime drummer for Cream and Blind Faith. An incredibly tumultuous life with a long history of drug abuse and careening from one problem to another. Due to his many arrests he was not able to get a visa to come to the U.S. for this world premiere. Fascinating movie. 21 Jump Street – 4 out of 5 – Jonah Hill and Channing Tatum star in this comedy. The movie-makers take the title and premise but little else from the old TV show that helped launch Johnny Depp’s career. This movie has lots of hilarious/farcical moments and no potential source of laughs is off limits. Hill and Tatum make a great comedic duo and it’s fun to see their high school persona’s flip as they return. This has a great cast including Rob Riggle, Ice Cube (very good) and others. There was a great Q+A after movie. Jonah Hill was hilarious and it seemed like all involved had a great time making this movie and it shows on the screen. This opens next week and except for those who don’t like rude/crude is highly recommended. This is the type of movie that is best when seen in a crowded theater so I recommend seeing this early in it’s release. Here are just a few thoughts on the festival and the movies I’ve seen so far. The BabyMakers – 2.5 out of 5 – A raunchy, farcical comedy starring Paul Schneider and Olivia Munn. It picks up in the 2nd half as the main male character decides to steal back previously donated sperm from a sperm bank when he learns that his sperm count is now too low. The raunchiness reminded me of There’s Something About Mary (but not nearly as good). This movie was ok but not very memoable..
Indie Game: the Movie – 3 out of 5 – A good documentary about the making of video games. This is not about the big corporate teams that make games but the individuals who have grown up playing video games and now have a dream of creating their own games that will have mass appeal. This is about rue geeks/nerds who get caught up in their dreams with different levels of success. The focus are the authors of Braid, Super Meat Boy or Fez. Has anyone played any of these games? Waiting for Lightning – 3.5 out of 5 – This was a very entertaining documentary about Danny Way and his attempt to skateboard down a huge ramp and jump over the Great Wall of China! It jumps back and forth between preparations for his jump and telling his life story. His story is interesting with lots of obstacles he had to overcome. Lots of great footage of his daredevil jumps (including successes and fialures and jumping on to a skateboard ramp from a helicopter!) and his dedication to his sport(s). It’s a great story and good tension as the jump approaches and the building of the giant ramp completes. I give this one 4 out of 5 and recommend it for everyone – you do not need to like or even care about skateboarding. Safety Not Guaranteed – 4 out of 5 – I really enjoyed this comedy. Excellent performances by Aubrey Plaza (similar to her Parks and Rec persona), Mark Duplass and Jake Johnson. The plot focuses on 3 reporters following up on an ad looking for a person to join Mark Duplass’ to travel back in time. But it’s really the characters interactions as they move forward with their lives and overcome some of their problems. The comedy is good and you develop a connection with the characters. Definitely go see it when it comes out. This had an excellent Q+A afterwards with the director and stars. Girl Walk // All Day – 4 out of 5 – This is an exuberant, fun and totally unique ‘dance music film’ set to the latest mash up album by Girl Talk in the streets of NYC. The music is awesome. There’s not much of a plot. It’s basically just 3 people (other professional dances sometimes join them) as they dance to Girl Talks’s latest album throughout the bustling city. Some people join in, some are oblivious and some enjoy watching. The energy never ebbs. Some of the locations included the subway, Yankee Stadium (during a game), Staten Island Ferry and many more. I wonder if this will have copyright issues with all the music but hopefully they have those resolved. Below is a picture of several in the audience dancing during the final credits! I did not see the Joss Whedon produced Cabin In The Woods as I am not a big horror genre fan but I heard a lot of good things about it from people on lines. So Keep your eyes out for it. For those in Austin, I attended a movie last night at the new Alamo Drafthouse Slaughter Lane. It is the best drafthouse yet. They didn’t put seats where the first 2-3 rows would normally be and each table is just for 2 seats so there’s no more need to climb past people or crawl under the table! Check it out. I had minimal expectations of this movie; it was a compromise decision because my wife didn’t want to see anything “serious” last night, and I had been hearing Howard Stern anticipating John Carter, so I figured it might be amusing. Wow, I really enjoyed it! This is what Cowboys and Aliens could have been, or the last Star Wars, or Thor…just a thrill ride, good story, fun action, and fresh looking fight scenes (look for the “throw ’em in with the lions in the roman arena” scene). Even inter-species romance. Don’t take it seriously, especially when the hero starts bouncing up and down and doing stunts that realisitically only Tom Cruise should be able to do. The 3D version is what I saw, and it kept moving, never getting bogged down (although I did use the Run Pee app on my Android phone during one of the only couple of minute segments it said I wouldn’t miss much). Sure, there are anomalies, like why would Martians who can create flying machines, and inter-planetary transporters use pistols and swords to fight with. In fact, I couldn’t tell if they had invented electricity yet, since they were using actual torches to see in the dark. And if you were John Carter, the human hunk who finds a hot Martian chick enticing, wouldn’t you wonder if her reproductive mechanics worked in a way that was compatable to your pieces? I did. But if you check out this femme fatale Martian, played by Lynn Collins, pictured below, you can see how his logic might be blinded in favor of lust. Finally, in this election year, check out the intransience of the Martian citizens (the green variety), when they cheer wildly for one leader, then just as quickly switch allegiances to another. Too reminiscent of Hitler youth for me, or Tim Tebow fans in today’s world. One more thought: one of my favorite authors is co-writer for this screenplay, Michael Chabon. He’s an incredibly talented, inventive author, who has shown he can create alternative worlds, check out The Yiddish Policemen’s Union and Gentlemen of the Road. Enjoy! Where do I start? First, I am not the target demographic for this experience; I’m probably a factor of 3 times older than that! Why did I even go? Because I love fun, stupid movies that have nutty scenes such as The Hangover, Superbad, Bruno, and American Pie, as long as they are witty. Early Spoiler Alert…Project X is not witty. Ferris Bueller it’s not, although it certainly has some of its key elements. Although Project X brought to mind some wild college parties I attended back in the day, watching this film was more like watching a film of those parties, instead of actually participating in one. (actually I never even heard of a party as wild as in Project X, but memory enhances). Not so exciting if you’re not there, drinking, laughing, going stupid wild. It did keep me in my seat and had me smiling at various points, and its lead actors are OK, but more of the level of Triple AAA minor league versions of Johah Hill, Michael Cera, and Seann William Scott. I remember when I first watched Animal House, and like everyone rooted for Belushi and his frat buddies…for Project X I most identified with the middle aged-neighbor who asked for the party to shut down, too noisy since he needed to go to sleep to get up for work in the morning, or he’d call the police. I’ve fought this battle in my own house plenty of times. Most of you might want to spend your time reminiscing instead of going to this movie, unless you are under 17 and fantasizing about someday going to a party like this. By they way, the music is real good. 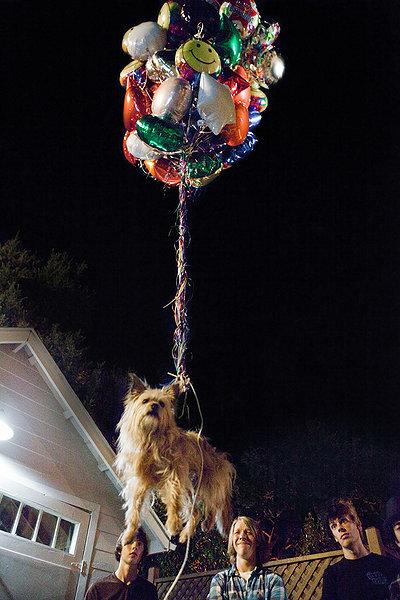 And I guarantee, the idea of flying dog with balloons came from Howard Stern’s show, innovative as usual. Next week is SXSW (South by Southwest) in Austin so everyone should be prepared for a lot of entries! SXSW pretty much takes over downtown Austin for 10 days of music (conference + shows), interactive (conference) and film (conference and film festival). They have even added a comedy component the last couple of years that has been growing significantly. I take the week off and check out a lot of movies and music, some comedy, and try to get some sleep. The film festival lasts for the entire 10 days of SXSW. The films run the gamut of Hollywood fare, narratives, documentaries, shorts, etc. There are well over 100 films playing at 11 venues. Many are world, U.S. or regional premieres and often the lead actors, directors and producers are in attendance and do Q+A sessions after the films. Since there’s a music festival going on at the same time, there are several music-oriented films that have associated music-oriented events. For example. last year I went to a documentary on the Foo Fighters and everyone waiting on line for the movie was given tickets to an unannounced Foo Fighters concert at a nearby venue after the show. It was a good movie followed by a great concert afterwards! I’m looking forward to seeing two music documentaries this year: Marley (a bio of Bob Marley) and Shut Up and Play the Hits (about the final shows performed by LCD SoundSystem). I anticipate James Murphy from LCD SoundSystem will be at the screening. SXSW is very accessible and I am able to get into most of the movies that I want. Most have 3 or 4 screenings during the 10 days (although the later screenings have fewer actors/directors/producers in attendance). $80 film passes are available that get you in all screenings not filled up by badge holders. For the music, in addition to badges there are wrist bands available that will get you into most shows. You can also volunteer to work for a few days and then get a wrist band for compensation. A lot of college kids do that and it is what my son does. The other option for music is to buy nothing and just do free or non official SXSW shows. There are free shows at Auditorium Shores that include the Shins, Counting Crows and the Cult as well as others. There are also many non-SXSW venues doing shows as well as official venues having free shows during the day. I don’t really do much at SXSW interactive. For those interested here’s a link with info. I think one of the keynote speakers is the head of Pinterest, the latest hot social networking phenomenon. Last year was the the first year I went to one of the comedy events featuring John Oliver and several other comedians. This year I look forward to attending a live taping of my favorite podcast, WTF with Marc Maron. I’ll try to keep everyone updated! Thin Ice was very entertaining with lots of good plot twists and turns. Greg Kinnear plays an insurance agent living in frigid Wisconsin with financial and other problems. When he meets Alan Arkin’s character, he sees an opportunity to take advantage of Arkin and resolve his own problems. Things don’t go according to plan and that’s when the numerous plot twists start kicking in. You may anticipate some of them but you wouldn’t expect all of them. Greg Kinnear is good as the unscrupulous insurance salesman but I enjoyed Alan Arkin’s performance more. Billy Crudup also provided some comic relief. With a wintery setting in Wisconsin and some similar plot lines, this film is reminiscent of Fargo. Although not as good as Fargo, Thin Ice is definitely worth seeing.